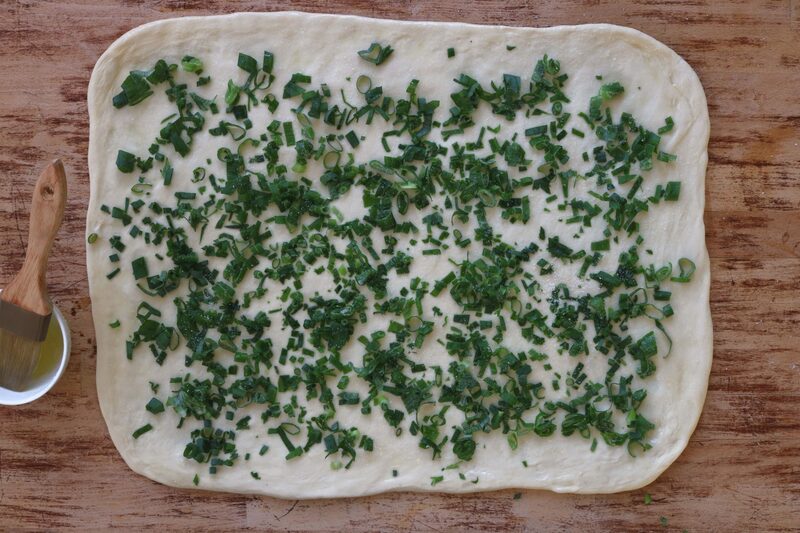 It can be messy, with melted butter oozing out the ends, so roll them out between pieces of parchment. That way, you won’t incorporate too much extra flour into the dough either. A storm blew in while I was making these, turning the kitchen darker than dusk, so apologies for the possibly helpful but less than beautiful photos. You can even freeze the uncooked ones, still rolled between layers of parchment, and cook them from frozen as you want them. Yes, it’s like the grown-up version of taking an Eggo out of the freezer and popping it in the toaster. And look – one more must-make thing off my to-do list! It’s too bad this edible list is so much more fun to tackle than the other ones. 1In a large bowl, stir together the flour, baking powder, baking soda and salt. Add the water and stir until the dough comes together; knead until the texture is, as Siu says, the same as your cheek. Cover the bowl with a towel and set aside for about half an hour. 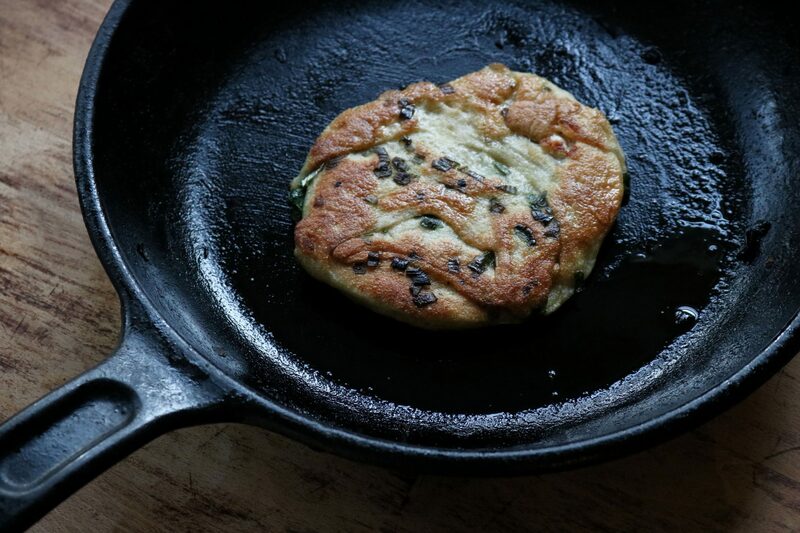 2Set a skillet over medium-high heat and melt the butter, oil and sesame oil. 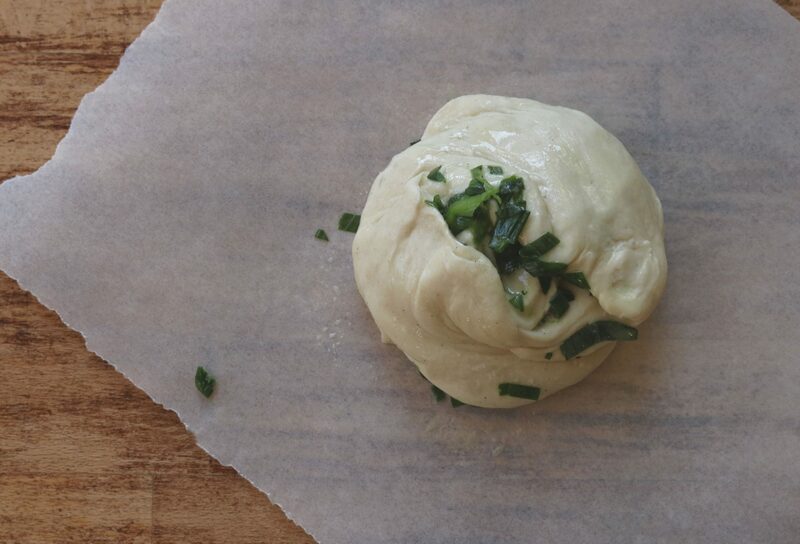 3Roll the dough out to a large oval as thin as you can get it. 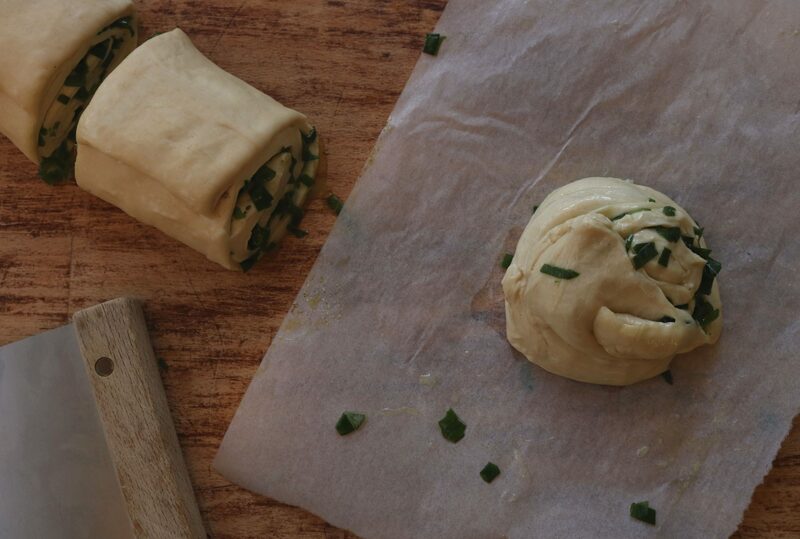 Dip a pastry brush into the melted butter-oil mixture and brush generously all over the dough. Sprinkle with chopped green onions and salt. 4Starting at a long side, roll the dough cinnamon-roll style into a long roll. Cut crosswise into eight pieces. Squeeze and pinch the ends of each roll shut, twisting it slightly as you go. 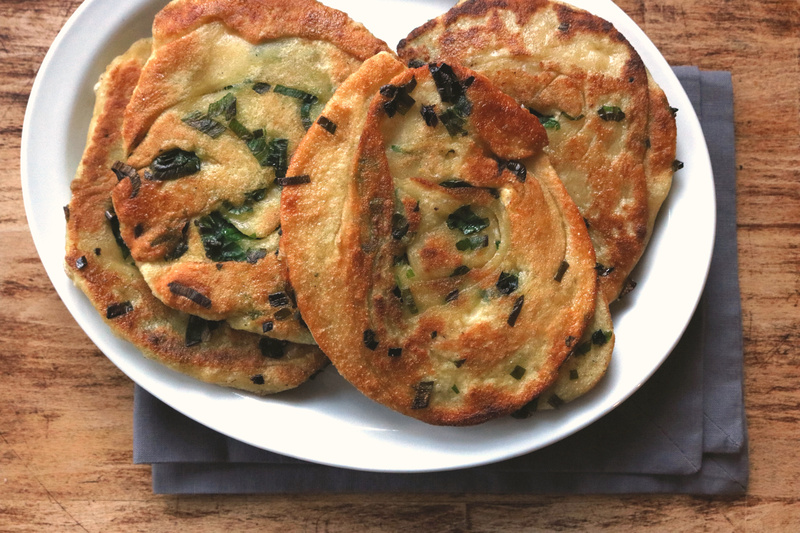 Flatten into a pancake with the twisted ends at the top and bottom. 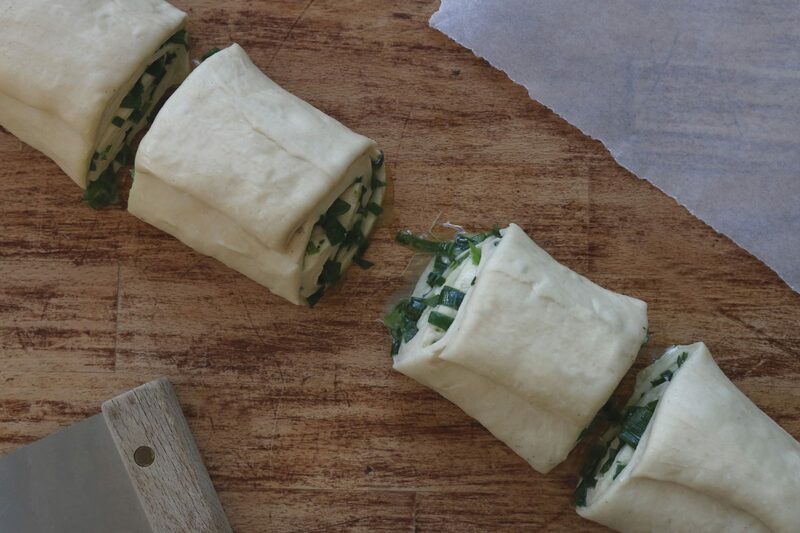 5Roll each out into a thin pancake between two pieces of parchment. (At this point, the cakes can be frozen, with layers of parchment in between—cook them straight from the freezer.) Cook the cakes in the hot skillet, with a bit more oil or butter if you need it, until they’re golden on each side. Serve warm, with hot sauce. These sound really good. Thanks. Even though I’ve never heard of them, I thought they sounded good, then l got to Sesame oil in the ingredients and have to up the ranking to excellent. I’m a sucker for anything with Sesame oil in it. Can wait to try once l restock the oil. ooooh, I had no idea! What kind of sesame oil was used, dark (toasted) or light? I understand toasted sesame oil can only be used as a flavouring (it has a very strong flavour) and is not suited for frying. It does have a strong flavour, but I do use it for fried rice and other things.. usually I just add a small drizzle along with my regular cooking oil or ghee. Hmmm… So is it dark brown or a light golden color? I just want to make sure I buy the right one, the same one the Siu To uses in his recipe. I’d think either would work! I’m not sure which exact brand he uses.